Home Projects It’s all about the space…no trouble! 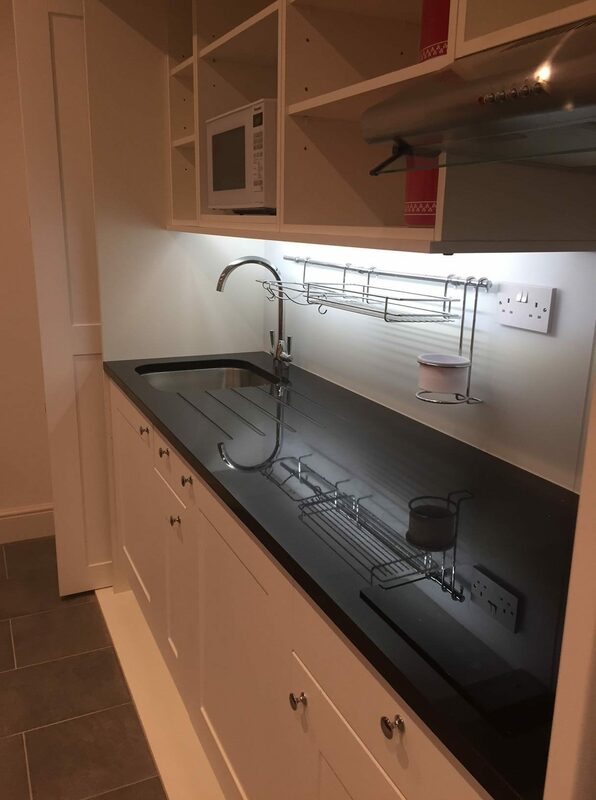 "The design and selection process was excellent… "
The kitchen is at the heart of the home. We cook meals with love, we wash up and above all we get things done. 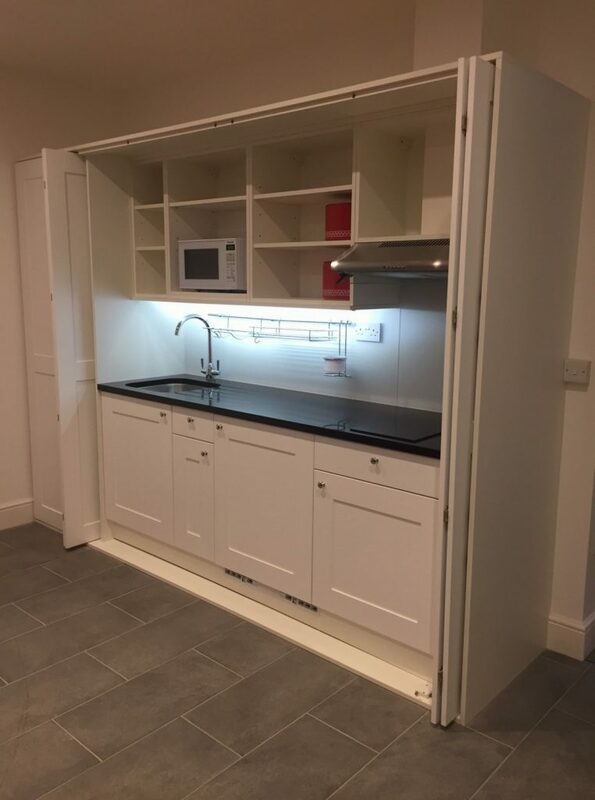 There is no doubt about the important role the kitchen serves but as one of the most frequently used spaces which must be, above all else, practical and functional is it feasible to squeeze it into a small space or even to disguise it? The answer is a resounding yes. Water supply, waste, electrical supply, cooking facilities, storage and refrigeration. 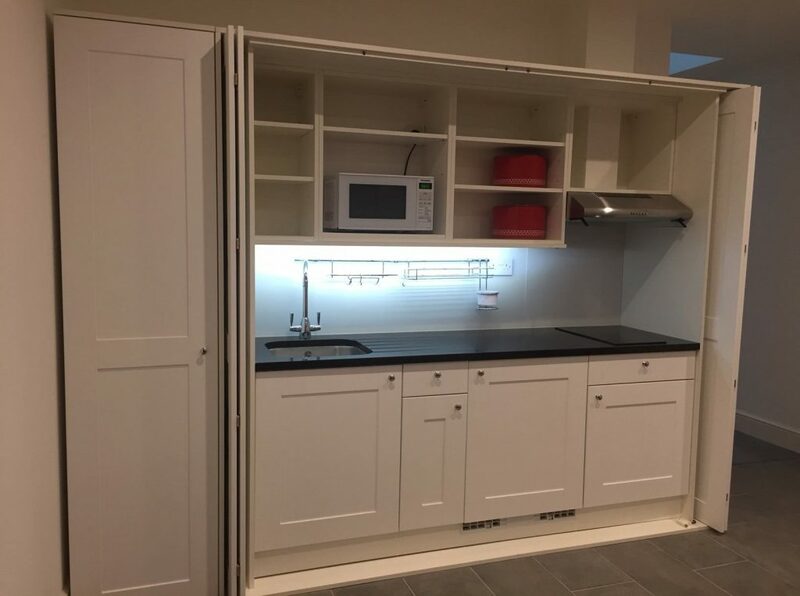 It all adds up but with considered design and selection of suitable appliances is it possible to meet the demands of a working kitchen in a limited space. 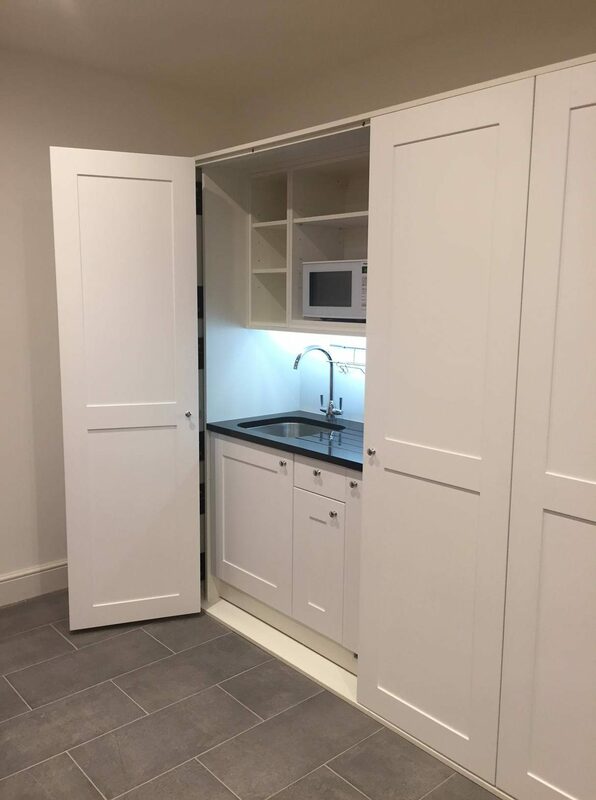 A recent project completed by John Strand and delivered a ‘big’ kitchen in a small space. 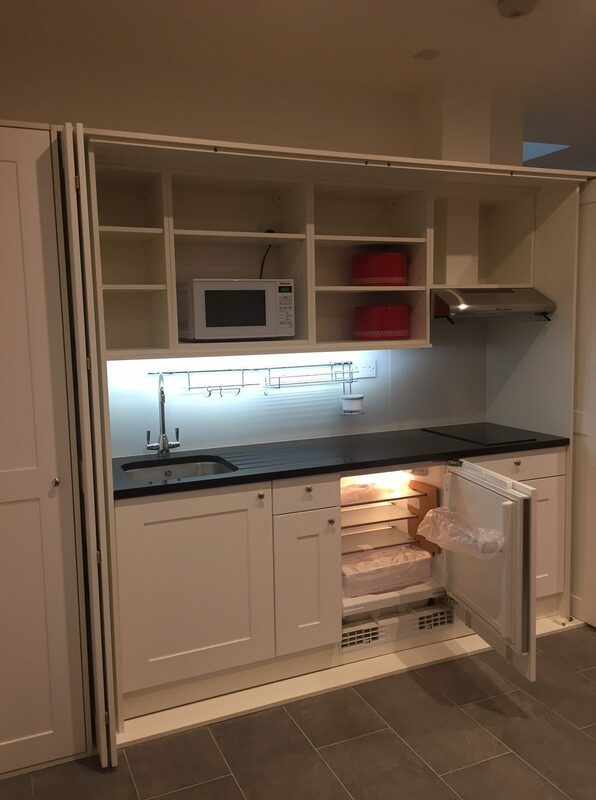 An American client needed a kitchen for their ‘vacation’ home in London. The kitchen would be situated in the basement under an existing mews house. As a holiday home the projects’ budget and timescale were flexible. 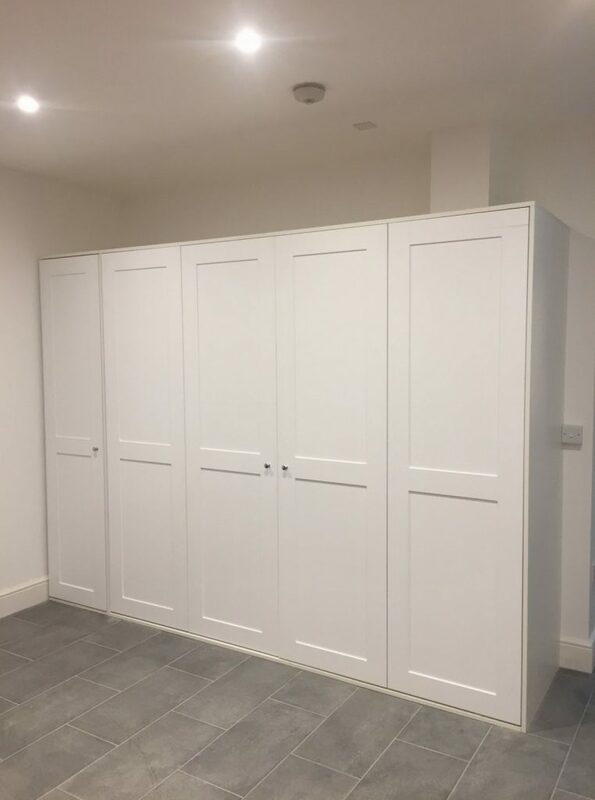 John Strand was recommended to the client by their architect and working directly together it was decided that a bespoke kitchen would be the most suitable option. John Strand’s in-house design team relish the challenge of a compact kitchen design. In this case a concealed kitchen with panelled retractable bi-fold doors. After initial meetings with the client, first draft designs were produced and after further conversations and consultations the final design was produced.